Packed with Mediterranean herbs and fresh lemon juice this is a wonderfully light refreshing salad. This salad will keep in the fridge for two days and makes a delicious healthy packed lunch option. It is also gluten free, egg free, dairy free and suitable for vegetarians and vegans … & packed with our amazing refined sugar free Tart Cherries by CherryActive. 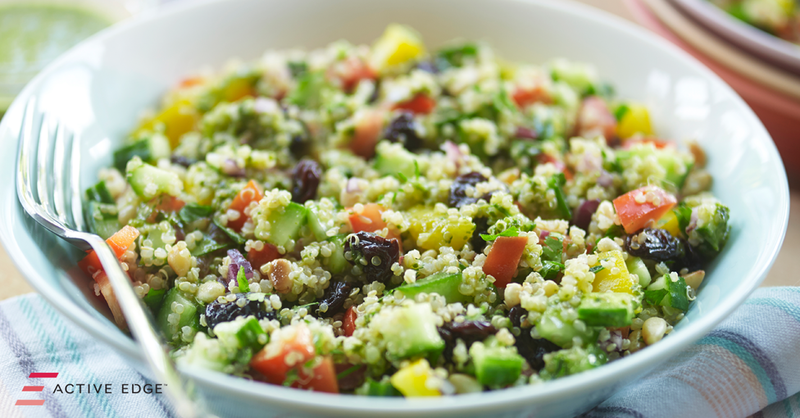 Place the quinoa in a large bowl and add the cucumber, peppers and tomatoes. Place the lemon juice, oil and herbs in a blender, process until smooth. Pour the dressing over the quinoa and toss. Stir in the CherryActive tart cherries, pine nuts and lemon zest. Scatter over additional chopped herbs to serve.